8-bit Memoirs is an eBook containing a collection of stories I remember from my childhood, about the gaming consoles and computers I experienced back in the 8-bit era in the 80s and 90s. The systems I experienced were the Philips Videopac G7000, the Amstrad CPC and the Amiga. 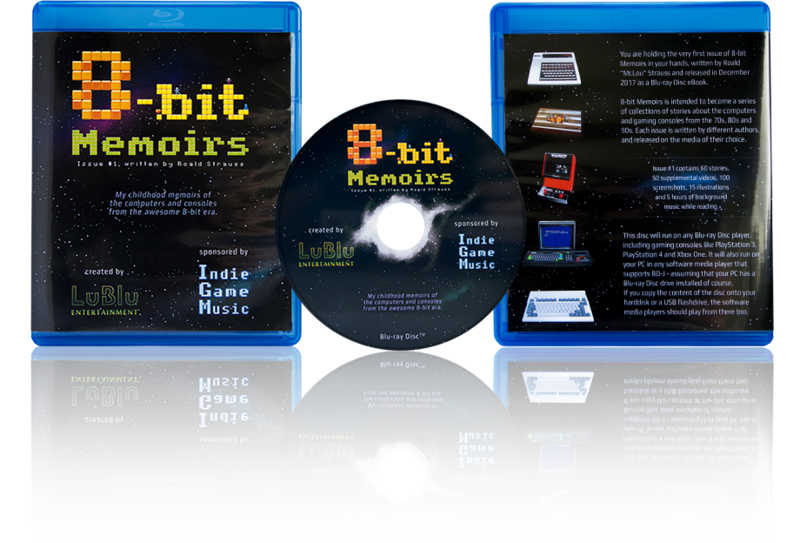 8-bit Memoirs contains 60 stories, 15 illustrations, 100 screenshots, 50 videos and 5 hours of background music while reading - all wrapped into a retrostyled diskmag-like GUI to boost the retro-feeling. "This is something seriously awesome!" "Equal to any commercial product I have bought. More than happy with its presentation and content." "Very good and very extensive!" A Blu-ray Disc, with printed label on glossy surface, in case with cover. A 23 gb ISO file you can download and play in any media player that supports BD-J. from "Simple mode" to "Menu mode"
before playing 8-bit Memoirs correctly. nearly as much fun as with PowerDVD. player is: 32bit Java => 32bit VLC. Want a light version for your phone or tablet? and the 9 hours of supplemental videos. Want to write the next issue with your own memoirs? Find guidelines inside the project.